National Pallets are one of the UK’s largest online pallet delivery service companies. We understand that when it comes to pallet delivery, one size doesn’t always fit all, and standard pallet don't suit every individual need. We believe you shouldn’t have to pay for a full pallet if you only need half! Everything we do is to make our customer experience as easy and cost effective possible, which is why we offer as many options as possible. 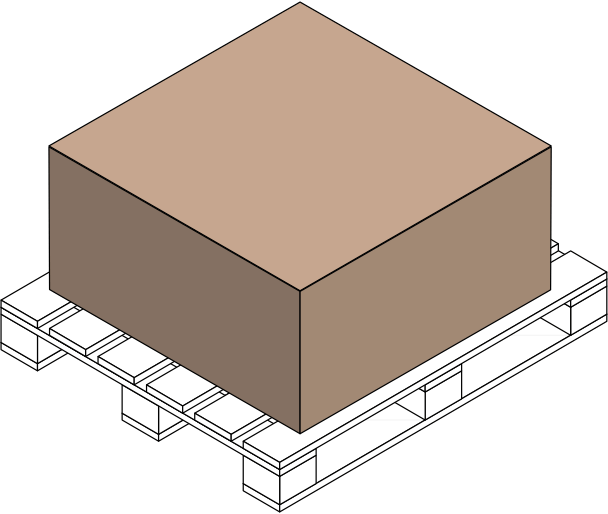 A half-sized pallet is the same length and width as a standard sized pallet; however, the height is restricted to 100cm. Providing a half pallet courier service, we can ensure you pay the best possible price for your shipment and needs. When booking your delivery with National Pallets, measure your consignment correctly to ensure your delivery is classed as half pallet size and avoid extra charges later. Once you check our pallet size guide for full dimensions, all you have to do is decide whether you need express or standard pallet delivery. Click 'Get a Quote' and book your half pallet delivery service with National Pallets today! Do I need to deal with customs when shipping a pallet from the UK to Europe? No. When sending within the European Union, your pallet delivery is treated the same as if you were sending within the UK, so you don’t need to deal with international customs when sending your pallet. How much does it cost to send a half pallet? You can send a standard half pallet (up to 500kg) for as little as £44.80 ex VAT. For more information on pallet delivery prices, click here to get a quote. How long will it take to deliver my pallet? Standard delivery time to within the UK is two days, or a one day premium service is available. Within Europe delivery time will vary depending on destination, both standard and premium services are available. For an exact time frame enter the details into the quick quote tool.